Rise Time Ambient to upper limit in approx. 15 min. Pull Down Time Ambient to lower limit in approx. 35 min. Associated Environmental Systems SD and FD Series Mechanical Refrigeration Chambers offer a wide variety of bench top and floor model testing equipment for simulating low temperature environments. 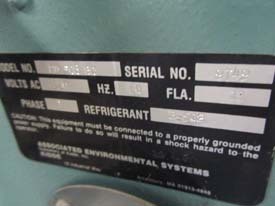 The refrigeration system of these test chambers are either conventional single stage systems or two stage cascade systems. 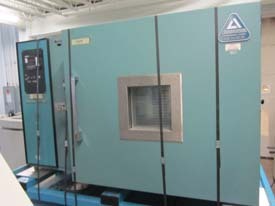 All of the chambers are designed to satisfy both military and commercial requirements standard to industries performing low temperature test programs. 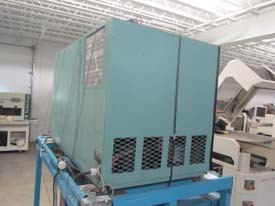 The single stage unit consists of a single compressor and single refrigerant. 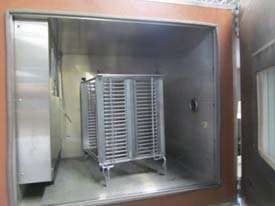 Associated uses a single stage system on all standard and custom designed chambers requiring a low temperature limit of -35°F/-37°C. Was just taken out of lab in good working condition. Buyer is responsible for all shipping charges from Boston, MA location. We can skid, package, crate, and ship to countries overseas by boat of airplane. 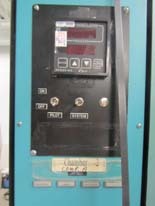 We also have another similar temperature chamber for sale. Buy both and we will give you a discount.